Short-term hydropower generation forecasts were lowered from 4.46TWh to 3.06TWh in 2019. Fitch Solutions has downwardly revised its short-term hydropower generation forecasts in Cambodia, from 4.46TWh to 3.06TWh in 2019, as recent droughts have threatened Cambodia’s hydropower output reliability, a report revealed. According to a statement released by the Ministry of Mines and Energy (MME) in March 2019, the country is facing a nation-wide power shortage, and will be having nation-wide power cuts that might last until end-June. This was largely attributed to the droughts which have dried up hydropower dams and reduced power supply significantly for the country, compounded by the country’s strong power demand that have exceeded government estimates, Fitch Solutions highlighted. 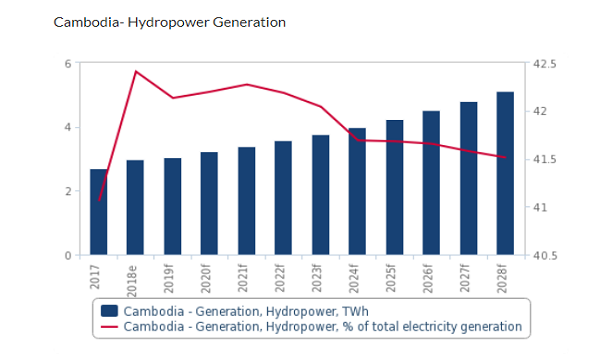 Cambodia’s power generation remains largely reliant on hydropower, accounting for an estimated 42.6% of the total generation mix in 2018. “We expect this to decline only slightly to 42.4% in 2019, due to a recent 400MW capacity addition in December 2018. That said, this is a drop from our original forecasts that have accounted for this increase, generating 3.06TWh instead of 4.46TWh,” the report’s authors noted. Meanwhile, Fitch Solutions said that the severity of the drought could lead Cambodia to increase electricity imports from neighbouring states to offset the domestic power shortage. Earlier in March 2019, state-owned Electricite Du Cambodge (EDC) signed an agreement with Electricite Du Laos to import 200MW of electricity over the next three years, which will be produced at the Don Sahong hydropower dam. “This is on top of existing agreements to purchase an additional 80MW from Thailand and 10MW from Laos to meet their power shortage. The government is also considering to purchase power from private companies, such as those in special economic zones, as well as renting a 200MW powership from Turkey,” the authors commented. Whilst the drought illustrates the challenges associated with relying heavily on hydropower generation, Fitch Solutions said it expects the Cambodian government to continue ramping up the country’s hydropower capacity to meet rising power demand and consumption, given that hydropower remains a cheap source of power generation that can play a key role in driving economic development in the country. The report highlighted how Cambodia has faced rapidly increasing power demand over the past decade, with expectations that net power consumption may continue to grow robustly at an annual average of 6.1% between 2019 and 2028. The growth is said to be driven by an expanding industrial and manufacturing sector, particularly for textiles, as well as a growing tourism sector. Cambodia's population is also forecasted to grow from 16.5 million to more than 18.2 million people by 2028, which coupled with the improving standard for living, will support rising power consumption. In early 2019, the government announced the development of a new hydropower plant in Pursat province, and is said to be studying and building significant hydroelectric schemes in the north and east of the country, along the Mekong River, the Srae Pok River and the Sesan River. “The government claims that a potential 2GW of hydro-capacity is possible by 2020, if all projects proceed and are completed on time. We currently forecast over 1.38GW of capacity online by 2020, short of government estimates,” Fitch Solutions said, due to the frequency of project delays and general environmental and social opposition from the region which could curb future growth in the sector. In addition to its hydropower focus, Cambodia’s government has tried to ramp up coal-fired power generation over the past five years. Despite some domestic opposition, the government remains generally supportive for coal-fired projects out of necessity in recent years. The report noted that there are two coal-fired power plants in Sihanouk with a total capacity of 655MW in operation, whilst a third with 700MW generation capacity is expected to begin construction in 2019. Since 2017, coal-fired power generation has surpassed that of hydropower, to make up a larger proportion of the generation mix.